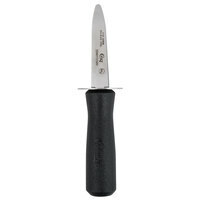 Quickly, manually open oysters with this Choice 3" boston style oyster knife with black plastic handle! With a long, narrow blade, this knife is a versatile option for effectively opening oysters of nearly any type or size. Regardless of your technique or familiarity with oyster shucking, this knife is the perfect tool for beginners and experts alike. They really should be charging more for this oyster knife. For this kind of quality you are getting a incredible deal. Works great and is holding up great. I recently did a raw bar for an event and this saved me so much time. It really is a stand out knife for cutting oysters and clams open. It was so cheap and affordable too. The Choice 3" boston style oyster knife is a great tool for opening up clams or oysters. A well made tool and super low price. A great item for any clam bake. This 3" black Boston style oyster knife was a great buy. I purchased a few of them. It's easy to use and was able to open up oysters easily. Would recommend for purchase. I have been using it for few months and it works like a charm. I really recommend it. Also once you have it then you don't get lazy about buying oysters. Don't let the price of this dissuade you. The price is amazing for the quality and it pops open oysters easily, without cutting through or cutting yourself. These oyster knives will pop a shell like the best of them. It's also small and sleek, meaning a fancy dinner party could see these. Comfortable grip and a blade that is just sharp enough without the risk of cutting to deeply or even cutting your self. A short blade for maximum control. Great price as well. I ordered these oyster knives after vacationing in the Outer Banks of North Carolina. While there I bought a dozen oysters and the only thing I had to open them with was a flat head screwdriver. This was a challenge, well no more!! These knives work very well and aren't nearly as dangerous. Wish I had bought them earlier. Nice simple shucker. Not recommended for high volume, but for a moderate basis they work great. They are labor intensive and make sure your staff is careful. Durable item that is dish safe. Would buy again. Been using these oyster knives in our store for over 1 year and they are still in great condition. Needless to say, it is very durable. I recommended these to our customers and now they are flying off the shelf. Very easy to use and good grip on the handle. Makes breaking into Gulf oysters with easy. This feels poorly made and flimsy, but it has held up nicely. It does the job! If you need a cheap oyster shucker, I recommend this one. You must have an oyster knife with a handle - great protection for your hands! This is sturdy and hasn't broken yet - fingers crossed! I don't eat oysters very often because they are hard to find fresh and cheap, but when I do, its nice to have this knife around! It does the job and I never feel the need to worry about it breaking when i'm popping an especially stubborn oyster. The 3" Stainless Steel Boston Style Oyster Knife definitely met my expectations. The quality is excellent as well as the price. Highly recommend! Can't recommend this enough if you prepare oysters often. The few times I've used it have been very simple. The handle is comfortable and it's a fair price. Very, very sturdy oyster knife. The handle is a good size for leverage when you need it. Was a great value compared to others I looked at. We had a large event involving oysters and used these guys. They were great. Very durable and easy to clean. Not a single one broke either. This is one of the best oyster knives we've used. The metal blade is thick and strong while still coming to a very thin and sharp end that makes it easy to work with on tight oysters. The handle is also very easy to hold and handle and the guard is just the right size. we will be ordering a second one. I purchased several of these for the price and didn't really expect much to be honest. I use these nearly daily in the kitchen and surprised what a deal they are as these knives have held up well. Recommend hand washing so the handles don't become loose. When your not using the knife on oysters you can also use the 3" Oyster Stainless Steel Knife to butter toast. Very sturdy and has a strong handle. So many uses. Excellent knife. We use these at our Oyster Roast fundraisers. Good grip, blade is excellent for prying open oyster shells. Since using these knives at our events, there have been no reports of slippage with injury. Good price. Great Oyster Knife. the look is very sheik and the produce works great. I would recommend this to anyone who shucks oysters on a regular basis. Handle is easy to hold a tight grip with when shucking. The small round piece allows to force into the oyster more without worrying about hitting hand on oyster. Blade is strong but a little too thick in my opinion. I used this oyster knife to shuck 6 oysters today, my first time ever shucking. The grip was fine, the blade worked fine. I understand that the blade can't be too thin or it'll snap but I felt like there were multiple times when I was correctly angled to get into the hinge but the thickness of the blade made it really difficult. That said, this oyster knife did the trick and I'm going to be happy to use it again tomorrow night. I was a little unsure about buying this item because of the price. It's so cheap, it can't be a good product, right? WRONG. This little oyster knife is very sturdy and makes quick work of shucking oysters. Very sturdy oyster knives. I bought four of them for our family to use when we make Oyster stew. We're able to shuck oysters much more efficiently with these now in lieu of whatever knives we could find in the house. This knife is very well made and the quality of the handle is very comfortable to work with. I didn't have any problems with the blade. It is a wonderful addition to my knife kit. This is a good oyster knife. Grips very well and does not slip. Blade is stainless steel and should last awhile. We've been using our knives and so far they've hold up pretty well. These are really nice. I love them because they are so cheap. If you lose one or happen to break one you can easily just pick up a few more. Whats the point in spending 50 bucks on an oyster knife? Cant beat the price for this high quality oyster knife! Works well with protective gloves to open oysters safely! Built to last and sure to please! I really like this oyster knife, good, sturdy, inexpensive. I'm going to order another batch of them for a large event. I didn't think the nicer one was worth it.